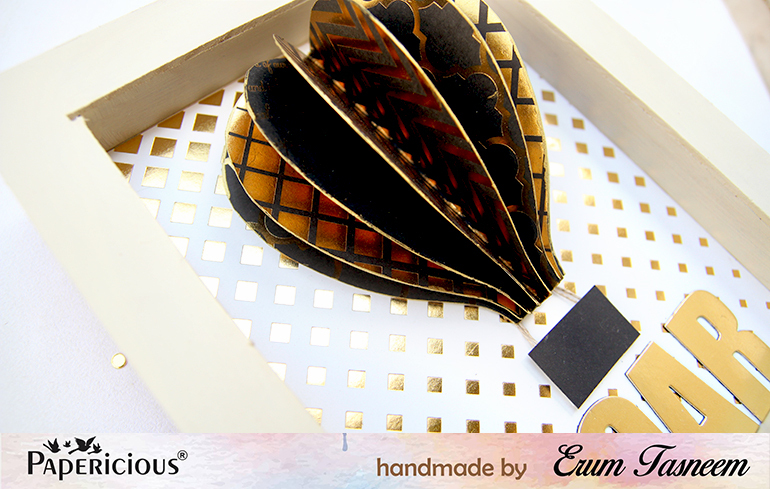 I have a new project over at the Papericious blog. Hope on over to check it out. 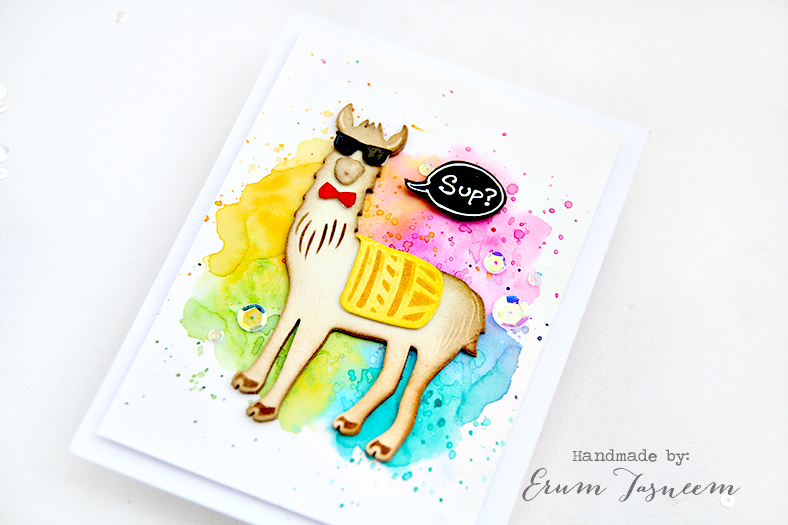 I have a new card with process video on the Altenew blog. You should definitely check this one out. The card looks super pretty! HOP ON OVER because I have photos to share! Or watch the video on YouTube in HD on my channel. 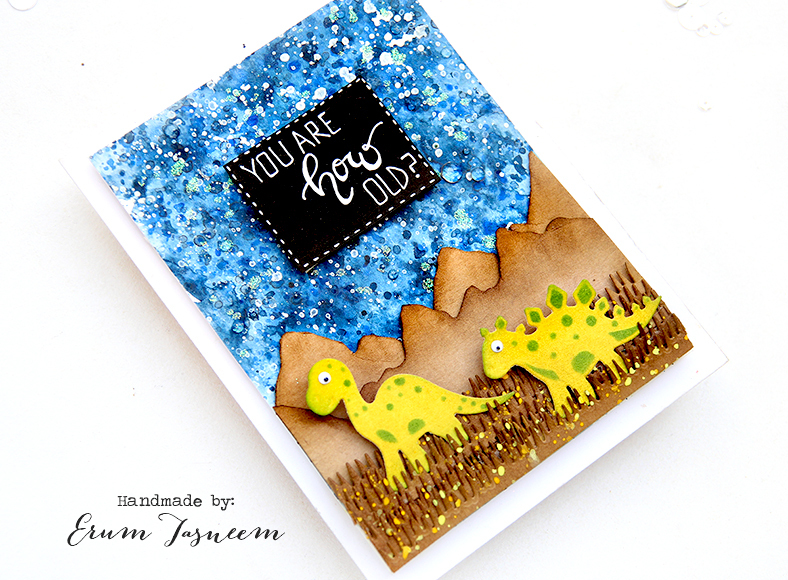 You must be here from the amazing Donna Mikasa's blog. So excited today! 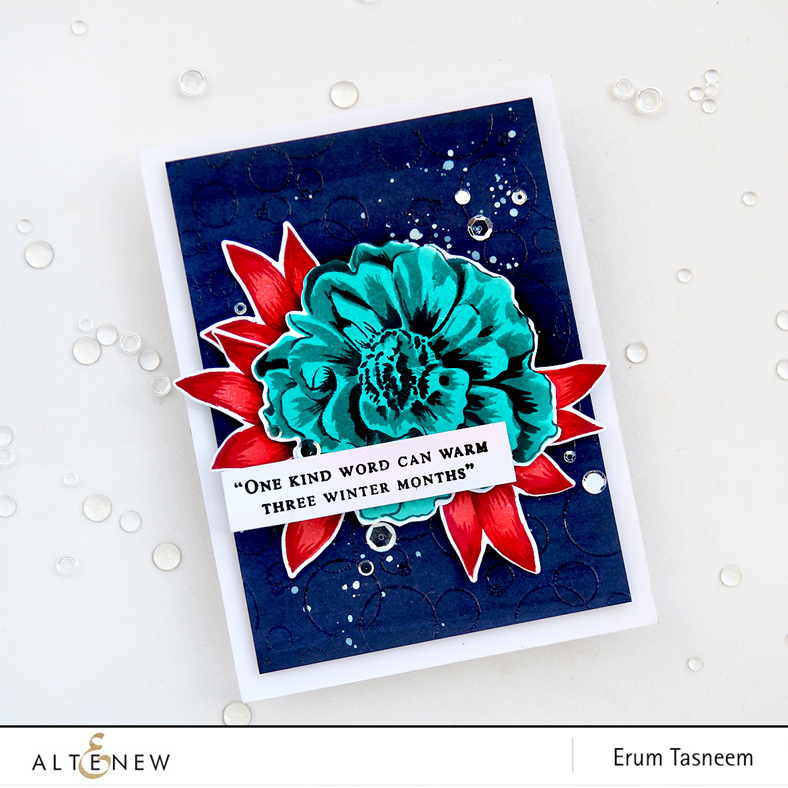 It's one year since Altenew released their first Build-A-Flower set which was a Camellia. For my card today I thought it's only fitting that I use the first set. I had this blue panel lying around which I coloured with distress stain. 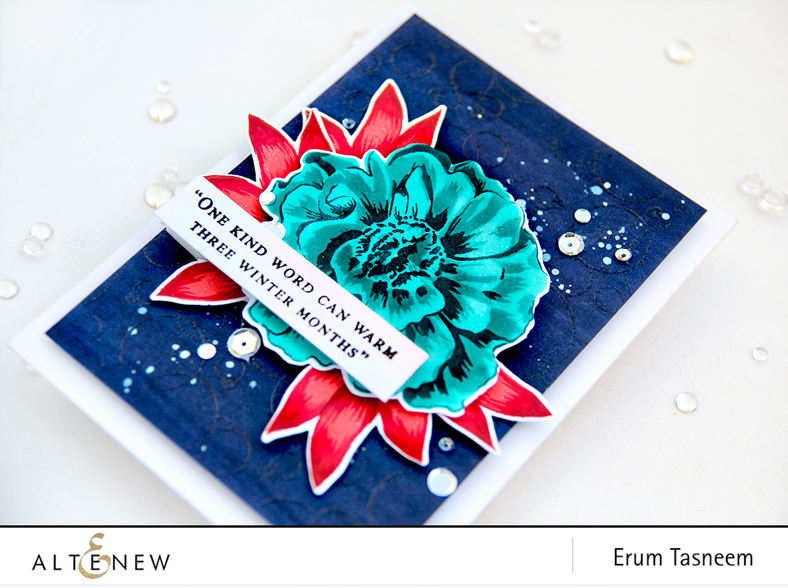 I stamped Pattern Play: Circles design with Altenew Clear Embossing Ink on this panel and then heat embossed it with Altenew Clear Embossing Powder. 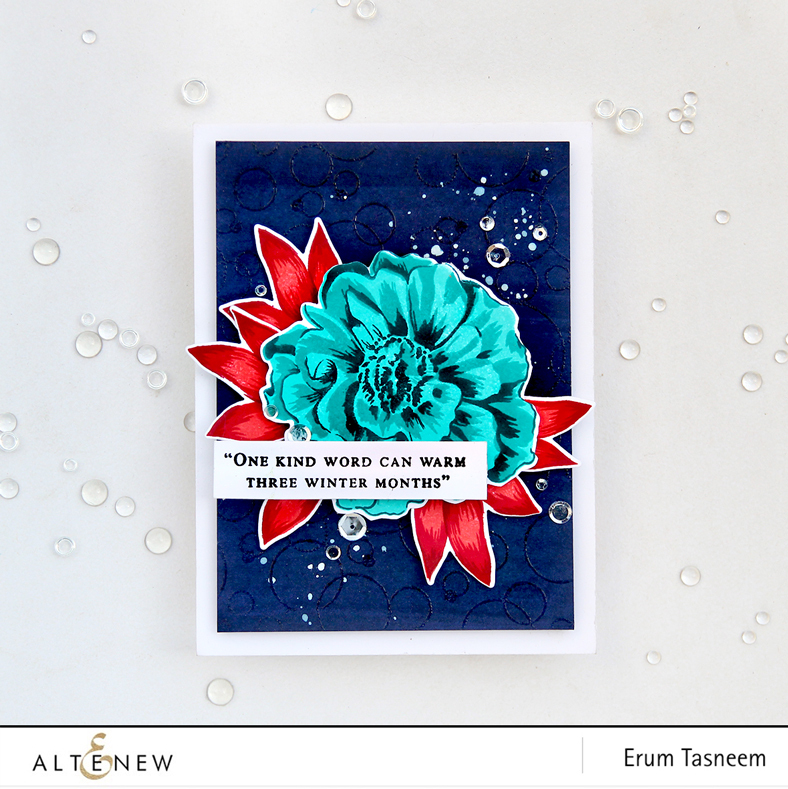 Next, I stamped the Camellia flower in our newest inks Sweet Dreams Oval Set. For the leaves I used, Coral Berry, Ruby Red and Grapevine. I also added a few white paint splatter. 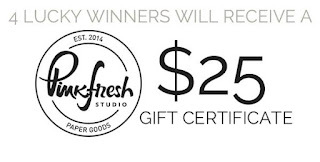 I will also draw a winner to receive a $20 gift certificate. I will announce the winner on 3/3/2018. 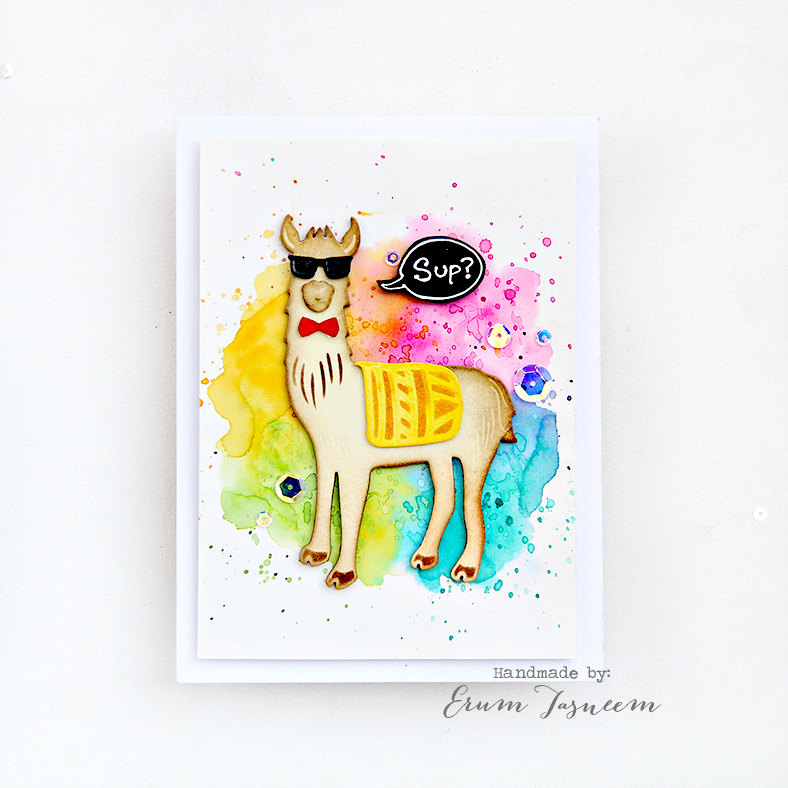 I hope you like my vibrant, bold card. You can watch the process video below or on YouTube in HD. Next stop on the hop is Zinia Amoiridou. 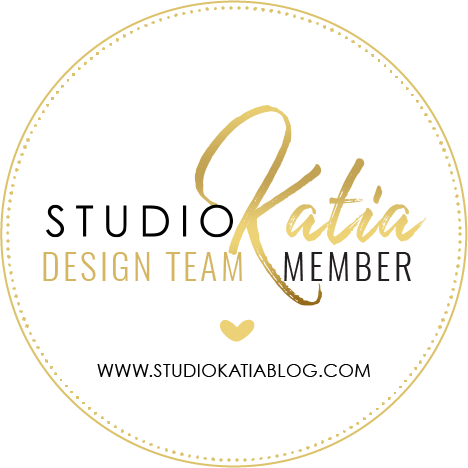 I have a new card to share over at Studio Katia. Please contact Spellbinders at socialmedia@spellbinders.us at the earliest. 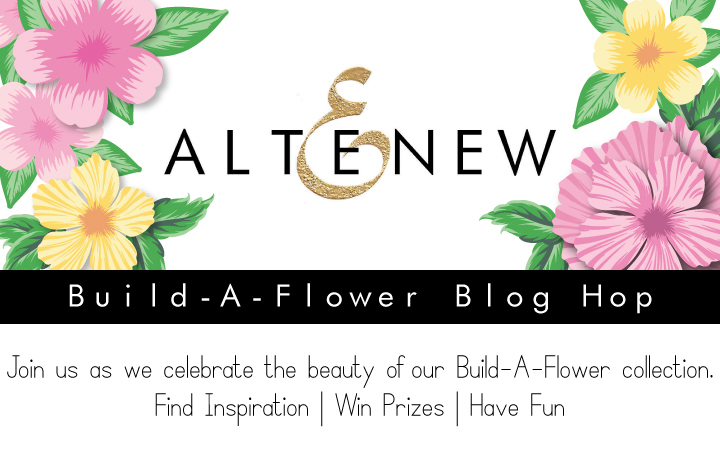 Please email winner @altenew.com by 28th february with the subject same as my post title plus my name. 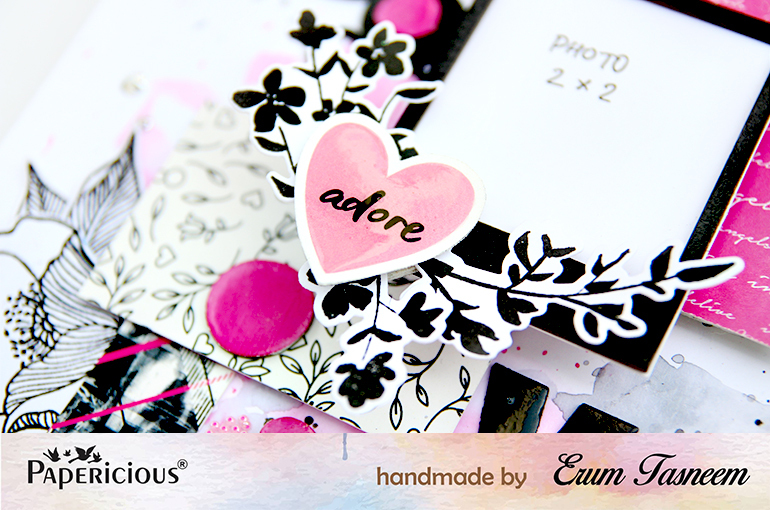 I have a layout to share over at the Papericious blog. 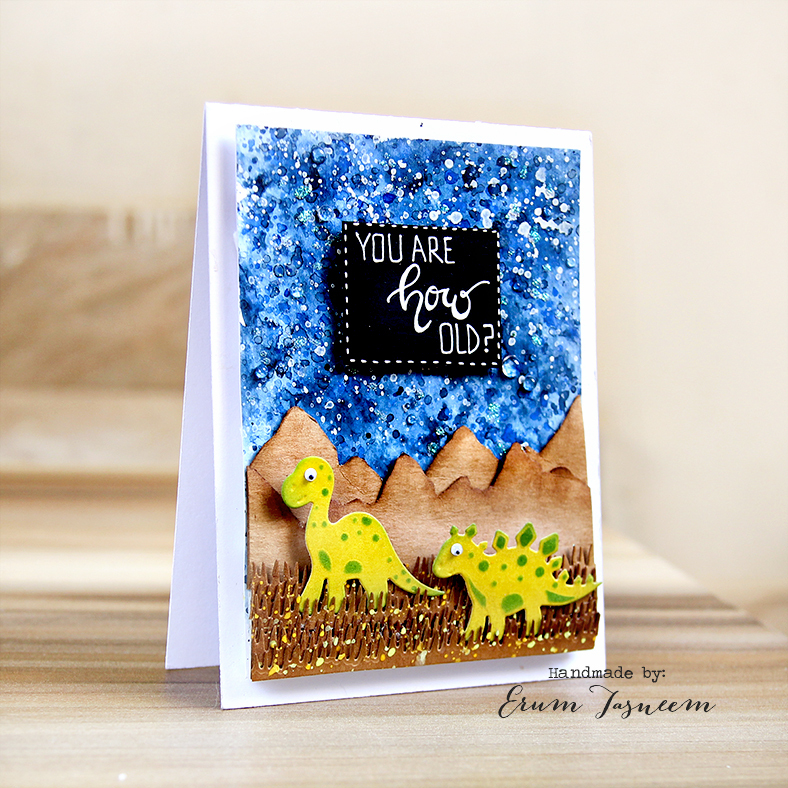 You must be here from the amazing Emily Leiphart's blog. 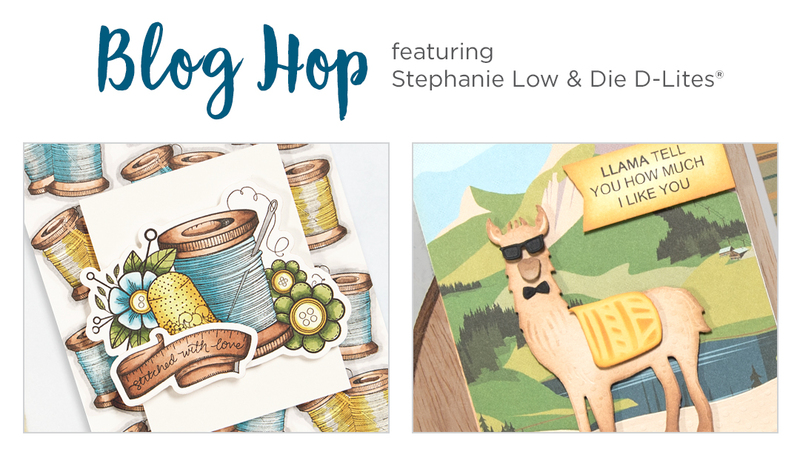 Welcome to Spellbinders Blog Hop. 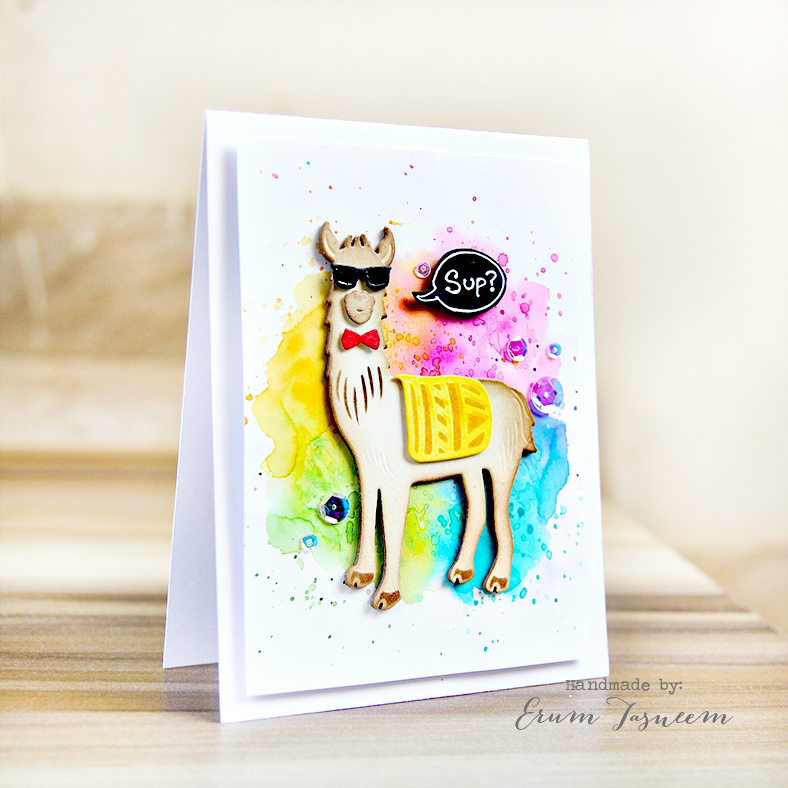 I will be using Die D-Lites on my projects and sharing a video for one of the cards. 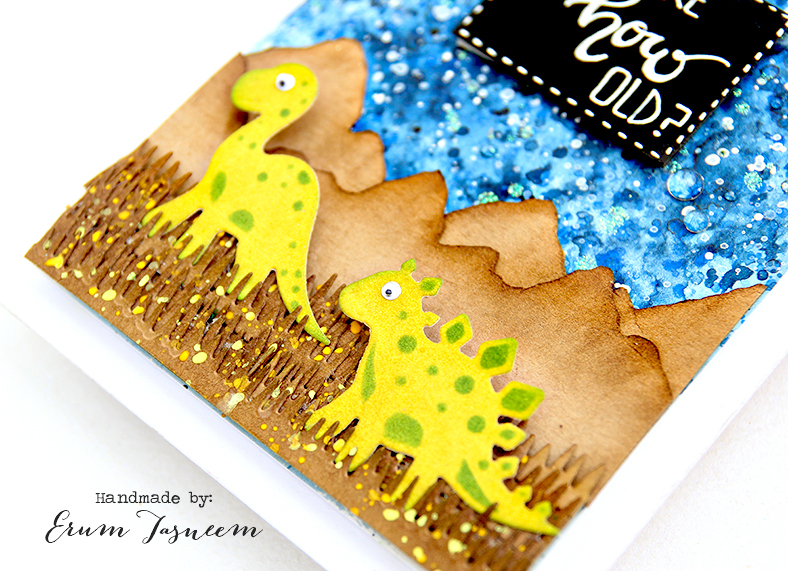 First one features the Picket Fence Etched Dies and Dinosaurs Etched Dies. I just used the grass die from the Picket Fence Etched Dies. I die cut the grass a few times in kraft and inked it with Gathered Twigs distress ink. After assembly, I added yellow and warm yellow paint splatters. 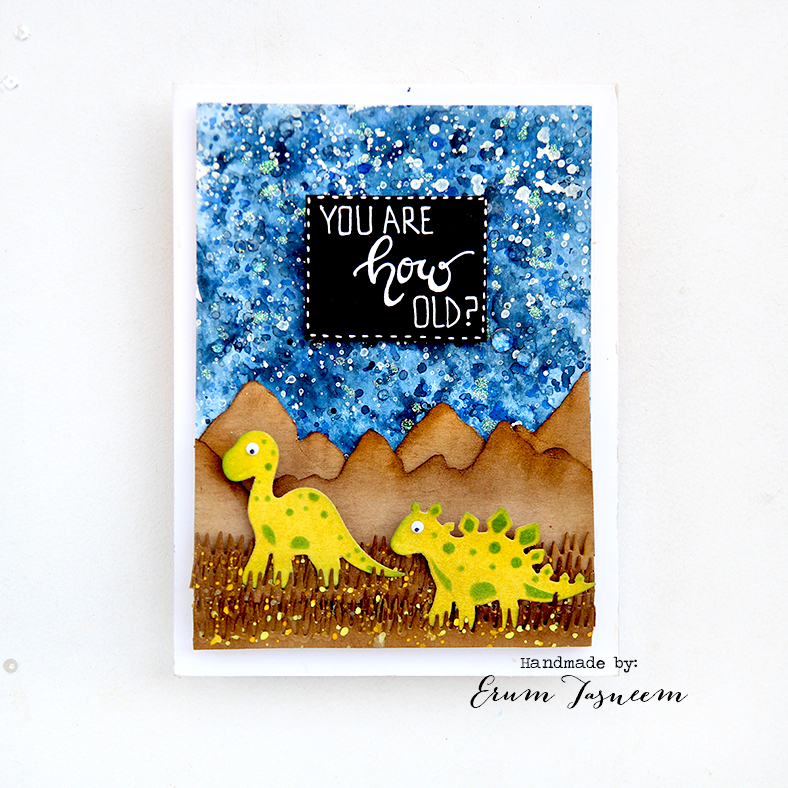 For the dinosaurs, I inked a panel with Crushed Olive distress ink and die cut these cuties. Then I inked them with mowed lawn while the die was still intact. 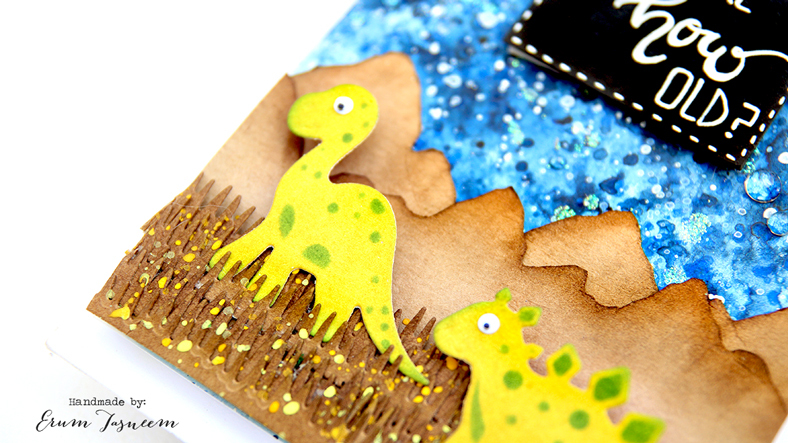 I added googly eyes to my cute dinos to make them even more cuter! Those mountain are hand drawn and then cut very roughly. For my background I used Gansai Tambi watercolours to make a night sky. 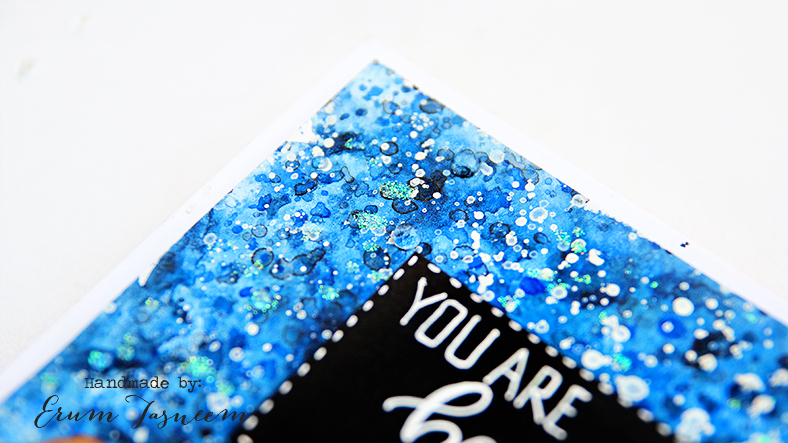 Then I added clear Nuvo drops and lots of holographic glitter dots for the sparkle. I really enjoyed making this. And how adorable are these dies?! Next up. 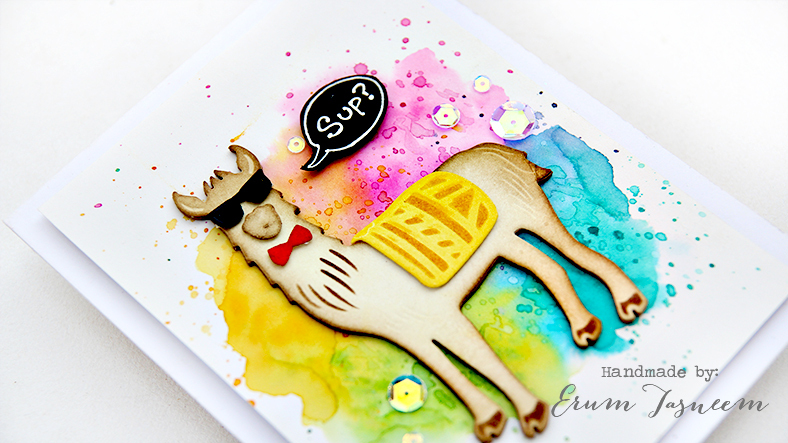 I have a video for this card :) This features the Hip Llama Etched Dies. 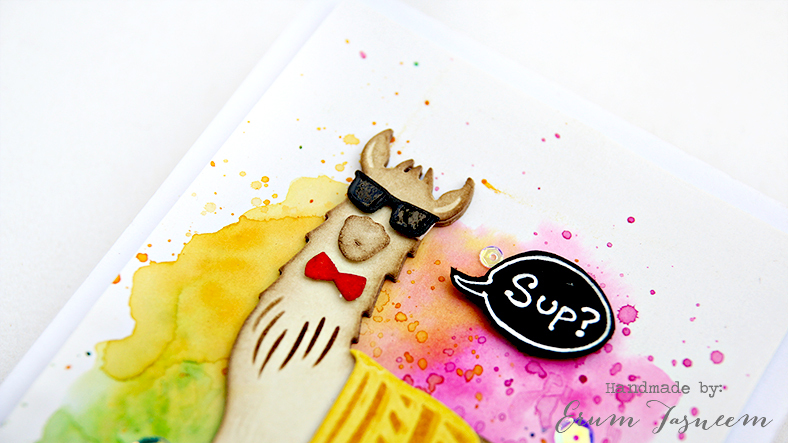 This is the most coolest, awesomest Llama in the town. Have you ever seen one in sunglasses? I will just share some shots with you here then you can watch the video. For the background I have used distress inks in Picked Raspberry, Peacock Feather, Crushed Olive, Mowed Lawn, Mustard Seed and Spiced Marmalade. The sentiment bubble is hand drawn and the sentiment of course is handwritten. I hope you liked both the cards. I swear, I had SO much fun making these. 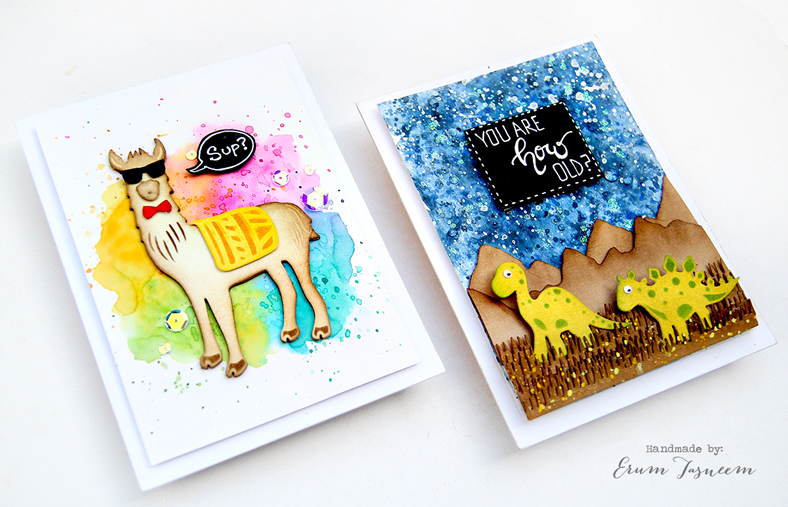 To celebrate this release, Spellbinders is giving away a $50 gift certificate to THREE lucky winners. 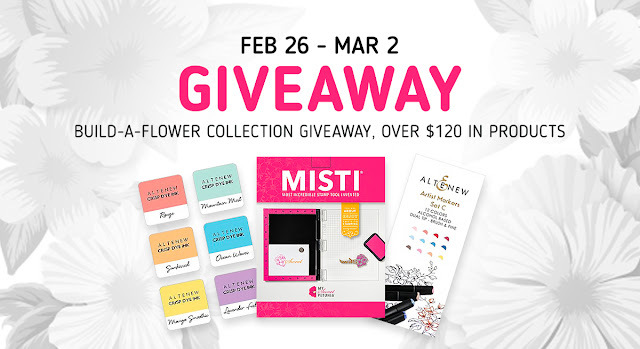 Please leave a comment on Spellbinders blog by Wednesday, February 21st 11:59 pm EDT for a chance to win. The winners will be announced in the blog hop post on Spellbinders blog the following day. 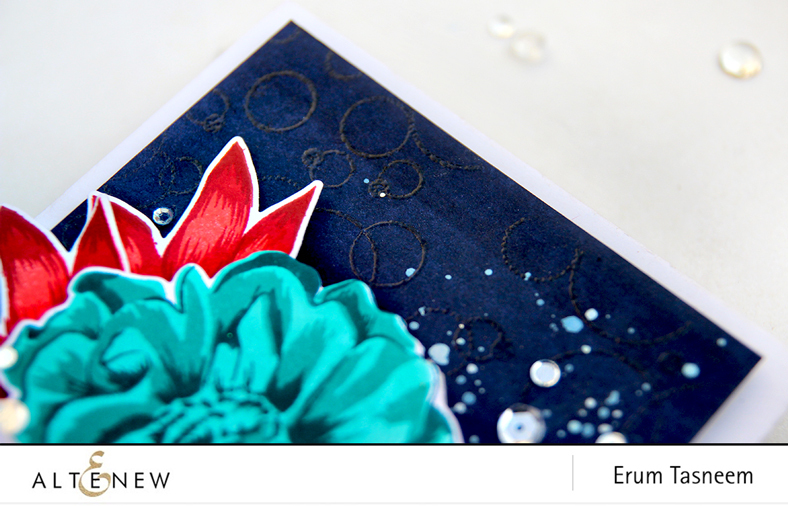 I am also giving away a $25 gift certificate to Spellbinders. I will announce the winner on February 21st. Here is the video or you can watch it on Youtube in HD. 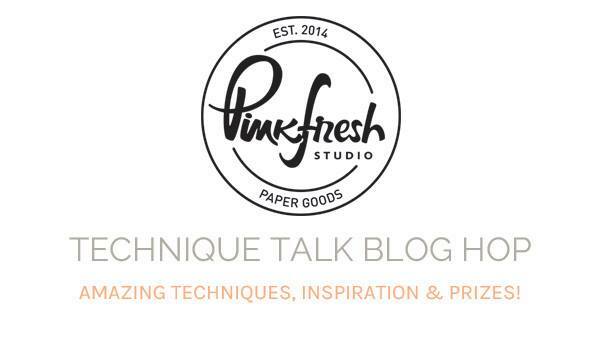 Welcome to Pinkfresh Studio Technique Talk. You must be here from the Pinkfresh Studio blog. The technique I am focusing on today is MASKING. 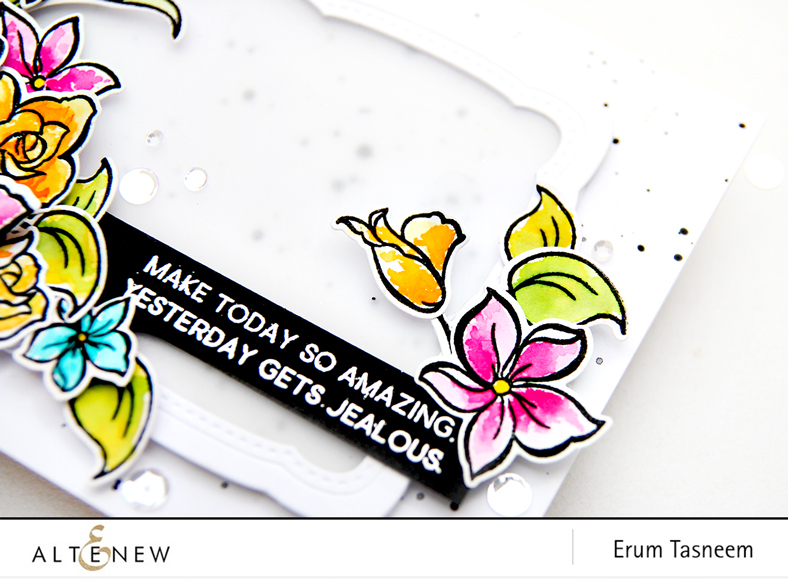 I do a lot of masking and always love the magical end result. 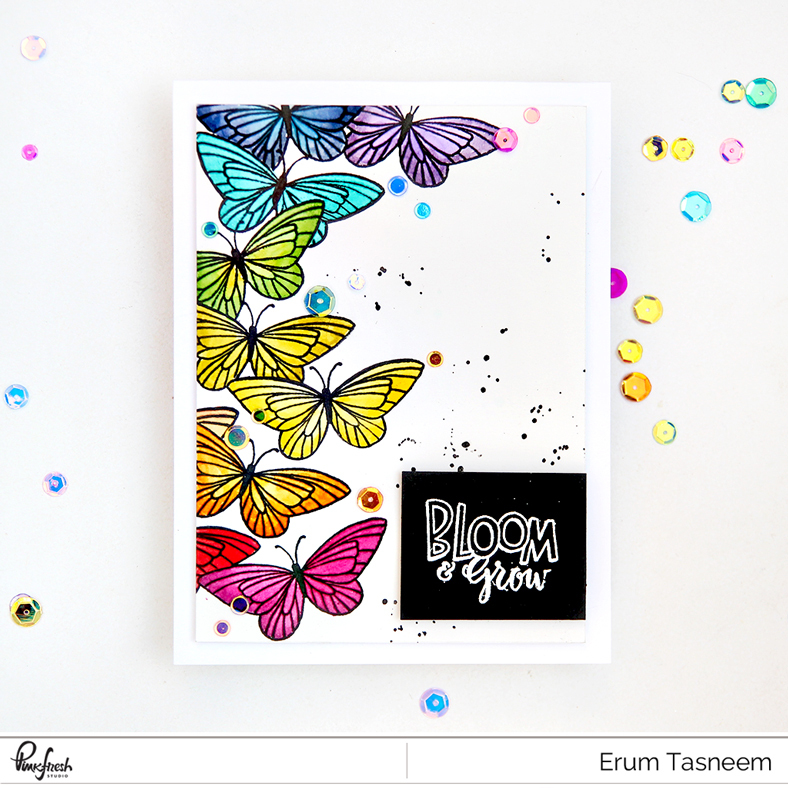 My card today features the whimsical Bloom and Grow Stamp Set. 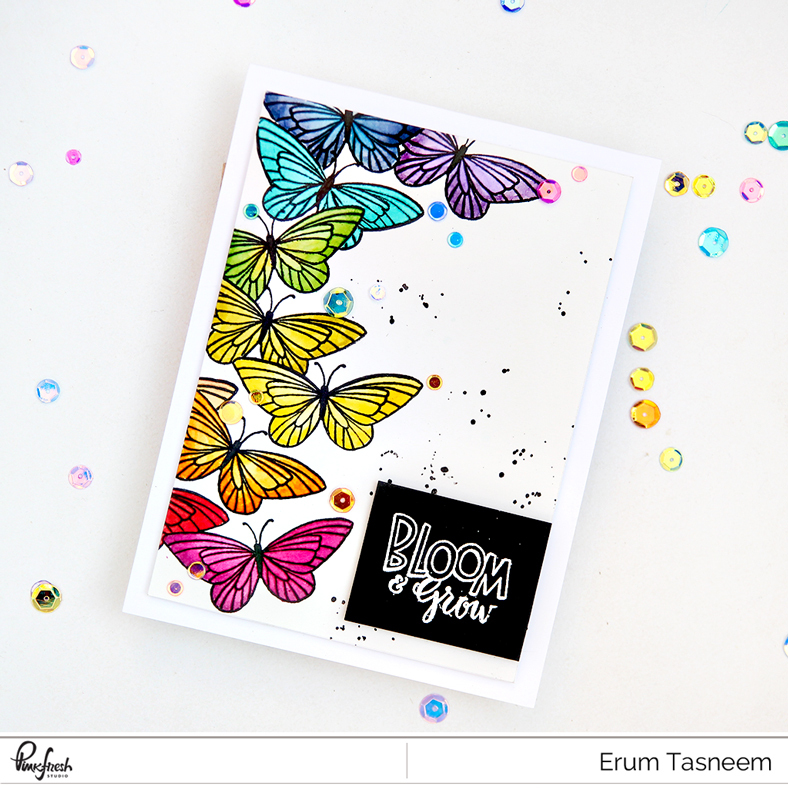 I used just one butterfly and stamped a trail. 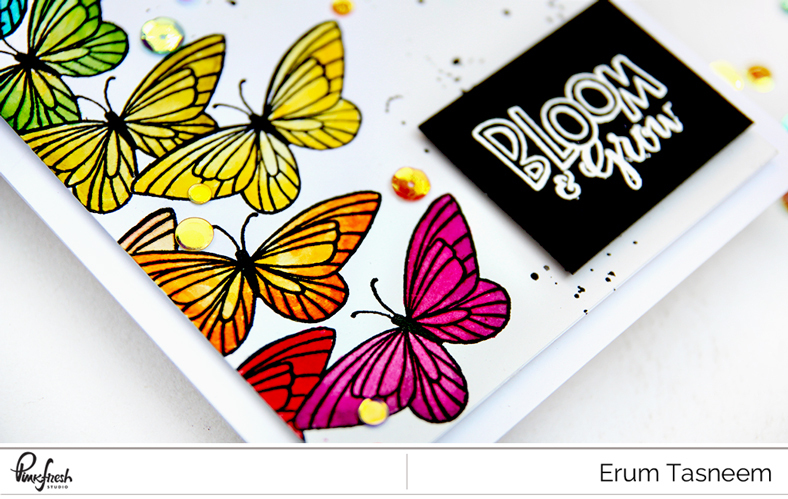 I started by stamping the pink butterfly, masked it and stamped the red one. 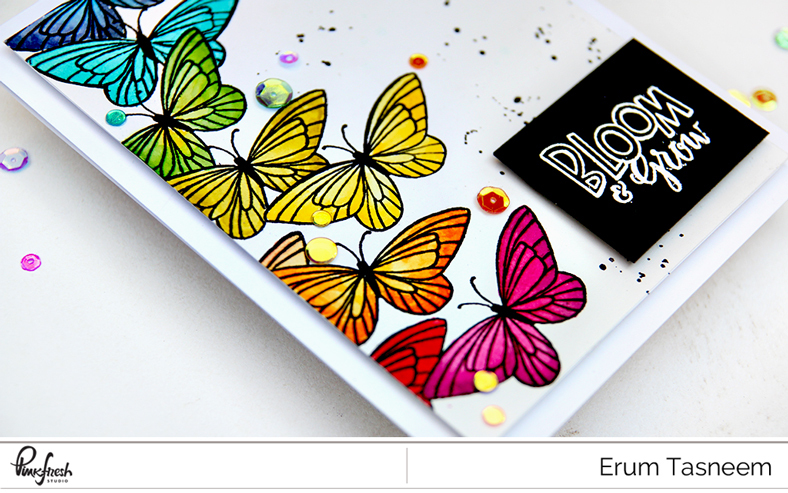 Next I stamped the orange butterfly, masked it and stamped the one that is peeking from behind it and so on. I used only one butterfly mask for this! 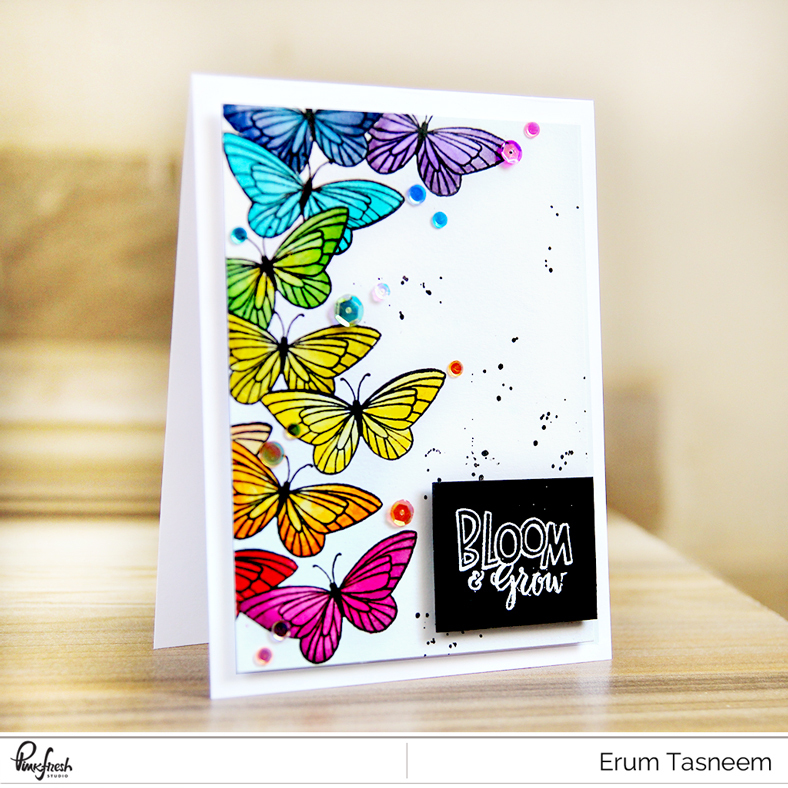 After I was done stamping, I watercoloured the butterflies in rainbow colours with distress inks. Then I added black paint splatters. 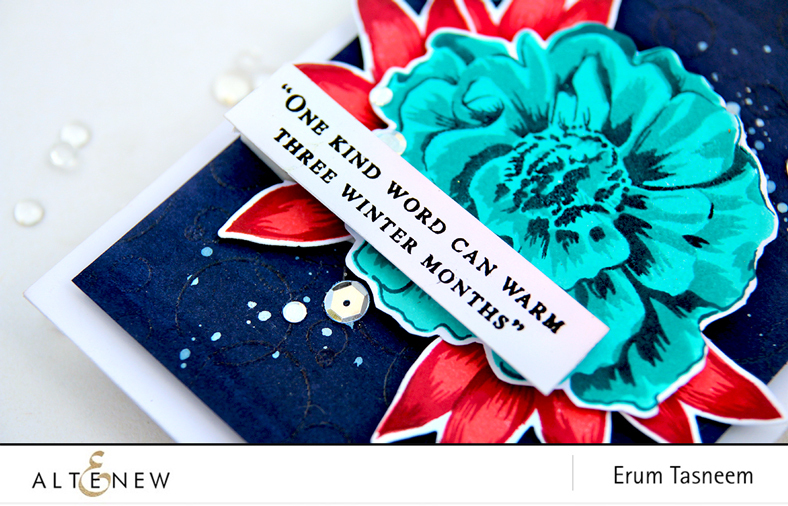 Next I stamped the sentiment on black cardstock and heat embossed it in white. FOUR $25 gift certificates to the Pinkfresh Studio store. Comments will close at 11.59pm CST on Monday February 26th 2018. Winner Announcement : Wednesday February 28th 2018 . Winners will be randomly selected, the requirement is that you comment on every stop on the hop. Please contact Spellbinders socialmedia@spellbinders.us at the earliest with the subject same as my post title plus my name. PS: Taking part in TWO hops tomorrow. Dont forget to to check out this space. Will be sharing a video as well. 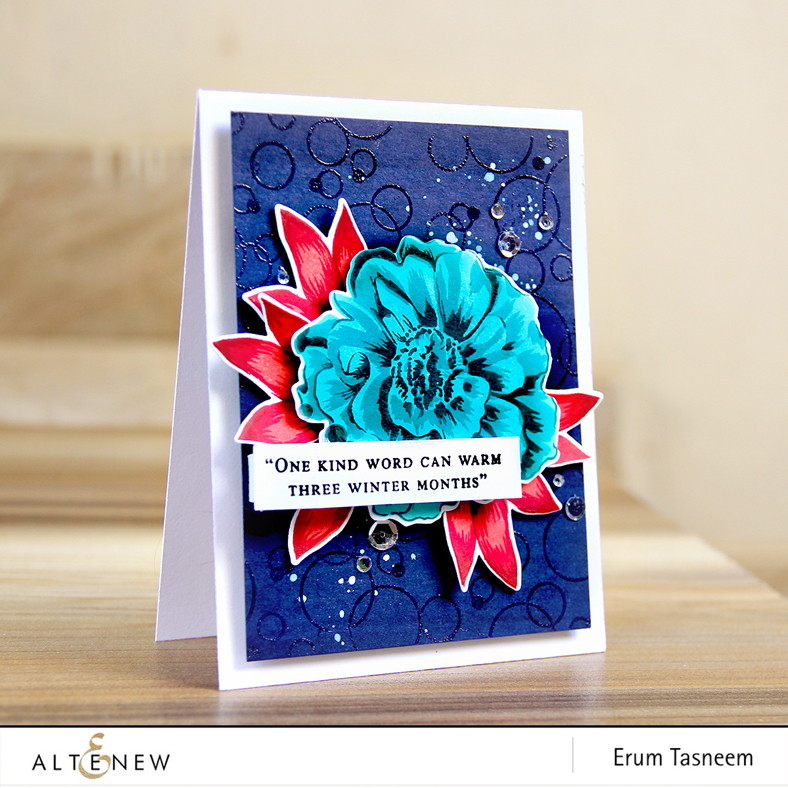 Two cards and a video waiting for you over at the Altenew blog. Sorry for the delay, we had no electricity all day yesterday. Please send en email to winner@altenew.com by 2/28 with the subject same as my post title + my name.